Two NFC East rivals, the Philadelphia Eagles and New York Giants, met in a NFC Wild Card playoff game at Philadelphia on January 7, 2007. Coached by Andy Reid for the eighth season, the Eagles were two years removed from a Super Bowl appearance but had stumbled thereafter. They were at 5-6 and without injured starting QB Donovan McNabb before, with backup QB Jeff Garcia behind center, they reeled off five straight wins to top the NFC East with a 10-6 record. 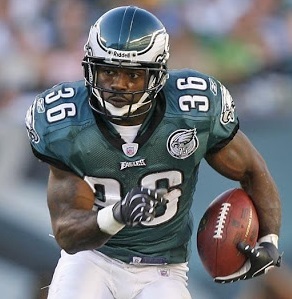 RB Brian Westbrook (pictured above), adept at both running the ball and catching it out of the backfield, was a key to the club’s success, and wide receivers Reggie Brown and Donte Stallworth were capable. The attacking defense had problems against the run but was at its best in the backfield, led by FS Brian Dawkins. The Giants were in their third year under Head Coach Tom Coughlin and finished third in the division at 8-8, following a 6-2 start, grabbing the second Wild Card slot. QB Eli Manning was inconsistent but teamed well with WR Plaxico Burress. RB Tiki Barber was coming off of a season in which he gained 2127 yards from scrimmage at age 31. Injuries to DEs Michael Strahan and Osi Umenyiora were damaging to the underperforming defense. The teams split their regular season meetings, each winning in the other club’s home venue. There were 69,094 fans in attendance at Lincoln Financial Field. The Giants had the first possession and, on the initial play from scrimmage, Eli Manning passed to Plaxico Burress for a gain of 29 yards. New York kept the ball on the ground as Tiki Barber (pictured below) carried three times for 25 yards and short-yardage QB Jared Lorenzen gained two yards to convert a third down. Finally, it was Manning to Burress once again for a 17-yard touchdown. Jay Feely added the extra point and the visitors had the early 7-0 lead. The teams exchanged punts with the Giants winning the battle for field position and keeping the Eagles pinned back deep in their own territory. With less than two minutes remaining in the opening period, Philadelphia commenced a seven-play, 84-yard drive that stretched into the second quarter. Jeff Garcia completed passes to Reggie Brown for nine yards and Brian Westbrook for six to start things off, but following a four-yard carry by Westbrook and a long incompletion, the Eagles faced third-and-six at their 35. Garcia ran up the middle for seven yards and a first down to finish out the first quarter and a short toss to Donte Stallworth gained four yards before Westbrook broke away in spectacular fashion for a 49-yard TD. David Akers converted to tie the score at 7-7. On New York’s next series, Manning fired a long pass on third down that was intended for Burress but was intercepted by CB Sheldon Brown, who returned it seven yards to the New York 37. Westbrook took off for 22 yards on first down and carries by RB Correll Buckhalter picked up another 11. The drive bogged down at that point but the Eagles took the lead on a 19-yard Akers field goal. The Giants came back with a long drive that started from their 20. Manning completed three passes, two of them to TE Jeremy Shockey, and Barber had a 41-yard run to the Philadelphia three. But the Eagles held at that point as two Manning throws were incomplete and a run by Barber picked up a yard. New York was forced to settle for a 20-yard field goal by Feely that knotted the score at 10-10 with 4:47 remaining in the first half. The Eagles responded with an 80-yard possession that took ten plays. Garcia completed six passes along the way, the last to Stallworth for a 28-yard touchdown. Akers added the point after and Philadelphia took a 17-10 lead into halftime. The teams resumed trading punts to start the third quarter before the Eagles, starting from their 25 after an apparent 65-yard punt return by Westbrook was nullified by a clipping penalty, put together a scoring drive. Garcia completed a nine-yard pass to Reggie Brown on a third-and-eight play and Brown picked up another 13 yards on a reverse. Garcia threw to Brown again for 15 yards and to Buckhalter for three and, while the advance was stopped at the New York 30, Akers kicked a 48-yard field goal that extended the home team’s lead to 20-10. In a series that extended into the fourth quarter, the Giants advanced to a score, helped along by a 47-yard pass interference penalty called on Sheldon Brown defending Burress. They reached the Philadelphia six before having to settle for a 24-yard Feely field goal that narrowed the margin to 20-13. The Eagles had to punt following their next possession and New York drove 80 yards in 12 plays. Barber ran for 13 yards on first down and Manning completed six passes along the way. The last three were to Burress, for gains of 18, 14, and finally 11 yards and a TD. Feely tied the score at 20-20 with 5:08 left in regulation. New York never got the ball back as Philadelphia put together a long, methodical series. Westbrook ran effectively and Garcia completed two short passes to keep the possession alive and the ball away from the Giants. Finally, with the clock down to three seconds, Akers booted a 38-yard field goal and the Eagles came away winners by a final score of 23-20. Philadelphia led in total yards (323 to 305) and first downs (19 to 17). Both teams ran the ball well, with the Eagles picking up 185 yards to New York’s 151. The Giants suffered the game’s only turnover but were penalized nine times to six flags thrown on Philadelphia. Jeff Garcia completed 17 of 31 passes for 153 yards and a touchdown with none intercepted. Brian Westbrook rushed for 141 yards on 20 carries that included a TD and Reggie Brown (pictured at right) led the Philadelphia receivers with 7 catches for 73 yards. For the Giants, Eli Manning was successful on 16 of 27 throws for 161 yards and two TDs with one interception. Tiki Barber, playing in the final game of his career, gained 137 yards on 26 rushing attempts and caught two passes for 15 more yards. Plaxico Burress topped the receivers with 5 catches for 89 yards and two touchdowns. The Eagles advanced to the NFC Divisional round and lost a close contest at New Orleans. They dropped to 8-8 and missed the playoffs in 2007. New York came back to claim another Wild Card spot in ’07 and advanced to a Super Bowl upset of the undefeated New England Patriots. 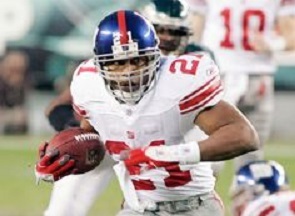 The loss in Philadelphia marked the last game for Tiki Barber, who had already announced that the 2006 season would be his last. 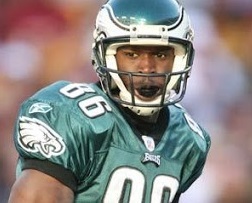 He retired as the franchise’s career rushing leader (10,449 yards) as well as ranking second in pass receptions (586). Barber gained 475 yards on the ground in seven playoff games, with the 137 yards against the Eagles his high for a single contest.